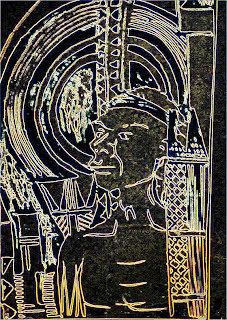 I found an old linocut print I once made of an Aboriginal face. This was first made when I was teaching art at a tech. school and the art department had plenty of printing facilities, soft lino and tools, etc. 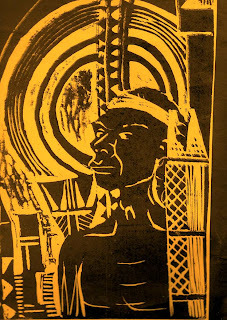 I always liked making linocuts, woodcuts, and screen prints, etc. 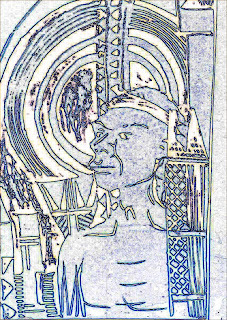 Here are some variations of that linocut. 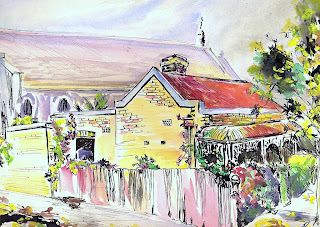 Here's a scan of an old watercolour and pen painting I made many years ago of a small cottage and some variations aided by Photo-edit. Click on pic to enlarge. The building is in the style of the late 19th century - about 1870 perhaps, the kind of house my grandparents once lived in. Small rooms but always a verandah in front with decorative verandah trim. This is a style common in many Australian cities and towns,inexpensive worker's cottages, but these days they are sometimes renovated and sold for half a million in the gentrified inner suburbs of our cities! There are a few in the street where I live, one near neighbour's verandah is still wrecked after a few storms. 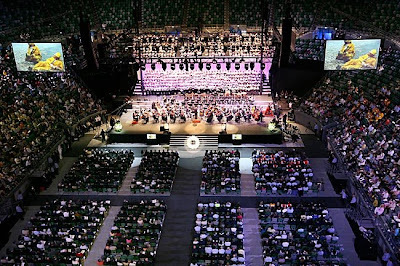 I hurried back home after morning worship and pancakes (it's nearly Shrove Tuesday)in order to watch the National Day of Mourning Service on TV which commenced at 11 a.m. at the Rod Laver Arena in Melbourne. I missed the opening and our rather ordinary National Anthem, and picked up with Aunty Joy, an Aboriginal Elder speaking, and holding a symbolic branch of gum leaves. It was a beautiful memorial service. There were too many speeches of course, and the best one by Ted Baillieu where he used a list of images vividly recalling the colours - yellow, orange, blue, khaki, of the emergency workers. Princess Anne graced the occasion with her beautiful diction but her speech was rather dull. Kevin Rudd gave a heart-felt speech about courage, compassion, resilience. The Governor-General gave a thoughtful tribute. Mostly there were good wishes and hope for the future, for rebuilding. Perhaps for many people though, it is not yet the time, as they are still in the stage of shock with unimaginable grief. Also, many people are in the burns units of our city hospitals. I was touched by the singing of the Leonard Cohen Alleluia which is a lovely lamentation (and I had played it on the piano earlier this morning at the East Geelong Uniting Church) the song 'Touch', the song 'We are Australian'. The symbols of a wreath and white flowers, the chime of triangles, the interfaith prayers by a Buddhist nun followed by Rev Jason Kioa, our Uniting Church Moderator, and a nice touch to see Jason walking down the steps with an Islamic leader holding his arm for assistance. 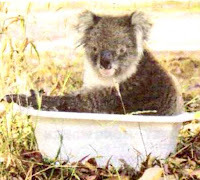 The choice of slides (on the TV anyway) was very moving and included pictures of the Australian bush before the fires, grieving people being comforted, the courageous voluntary fire-fighters, and a now-famous koala of course! Very well done, organizers. An excellent national occasion and for those who were there it would make for an indelible memory for the future. Three photos from Herald Sun. To each and every one of you sharing this quiet. To those in all the towns about. To those in homes. In prayer. In pubs. In hospitals. In city streets. To those in the relief centres. The staging points. To those who have assembled here. To those buried in each other's arms. Holding each other's hands. Wiping each other's tears. To those trembling still. To the children in wonder. To those who answered the call — from far and wide. In yellow, in green, in orange, in blue, in khaki, in white. And under the cross of red. And those still dusted in black. To those pitching the canvas. Those under it. Those who have lost homes. To family and friends of those who have perished. But most of all to those who have seen the flames. To those who have been blinded by the darkness of the day. Smelled the smoke. Heard the roar. And then in turn been deafened by the silence. Our simple message is: we are as one. Victoria is as one. You have our hearts. You have our hands. We could quell these fires with tears. But tell your stories. Tell your stories and let's lift the sadness together. Victoria at its most ferocious is now at its finest. And this is part of the speech by the Governor-General, Quentin Bryce. The unthinkable, we must think. The unimaginable, we must see. The unspeakable, we must speak. The unbearable, we must weep. We must allow the thoughts and images and words that have so recently scorched and swamped us to gently settle, and find their proper and worthy place in our hearts and minds. We must recognise these memories as an inseparable part of us. They are the make-up of our growing wisdom and our fresh intent. We are altered by them, yet they are what will forever sustain us. We must tend to the gaps left by those we have lost, and we must keep their smiles always in our sights. We must hold on to the pride we feel in what we've built, the admiration and gratitude we have for others' strength and courage, and our belief in our own. To be a whole person, or a whole nation, is not to enjoy a perfect, untrammelled life, untouched by challenge or catastrophe. Rather, it is the blisters and cracks, the scars and loss, the failures and sorrow, and our honesty and hopefulness in all that are the essence of our resilience, unity and completeness. Australians here and everywhere, today we acknowledge that life is indeed not perfect, and we give thanks to one another for being whole. 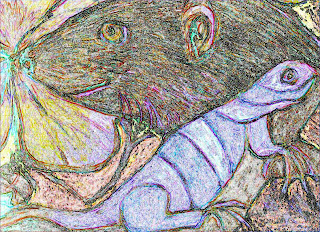 I played about with a pastel picture I made some time ago of a mongoose and an iguana, both creatures living in Fiji. One indigenous, one migrant. This is part of the picture which is quite large and won't fit into the scanner. I guess this is my salute to Charles Darwin. The world is an amazing place and the theory of evolution is fine with me and that doesn't mean that it is all accidental! 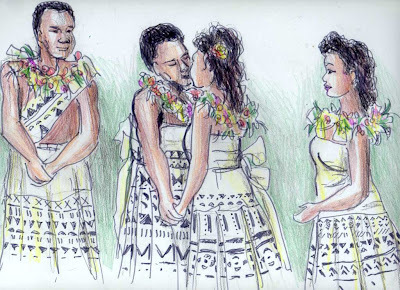 I've only made one drawing in the last few days - of a Fijian wedding - using coloured pencils. Somehow I'm very tired from lots of other things going on. This drawing is not from a photo or drawn on the spot, but I saw a pic in a Fiji newspaper and liked the arrangement of the four people. 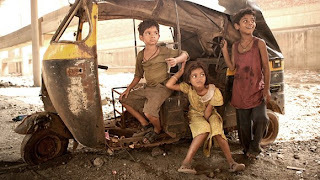 Last night we decided to see a movie, and after the hype I'd read about this new film, we watched 'Slumdog Millionaire'. There were many people in the theatre for a Thursday night and they all stayed during the credits which were over bhangra dancing at a railway station! It certainly was an enjoyable film, except for some gross scenes which I want to forget about. It was Bollywood a little - story of poverty to riches - boy and girl in love - well, that wasn't the usual singing around trees, and wonderful cinematography. However, the characters were not developed. The scene stealers were the children in the first third of the film - three children who were actually from the slums and still live there! By the way the word 'slumdog' is an insulting term to Indian people. As in 'Who wants to be a millionaire' here is a question with four possible answers. b. another Bollywood plot but done by a Westerner? c. exploitation of child actors? d. a superlative movie but flawed? 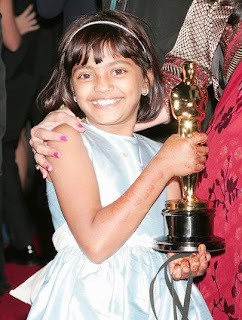 The child actors were paid very little money for their acting – mainly school fees, etc. so that's not okay when the film will make millions. First half well done, second half many coincidences and unbelievable. (Of course it's meant to be fantasy.) The leads - both rather dull acting. Female characters as victims. The early scenes were often spectacular particularly the race riots. The blue Krishna was a lovely touch. Language - Hindi should have been used in the police interrogation scene, and other places. The English accent and language seemed incorrect for a young man who lived in Mumbai slums and his schooling wouldn't have given him that accent. One little glitch - the young woman has scars on both sides of her face in one scene, one scar in other scenes. As a whole, the film didn't have credibility for me, though it certainly was an excellent movie in many respects. Check out some of the websites, especially those where the opinions of Indian people are aired. (later - Tuesday morning.) Well I am surprised at the accolades to this movie. Eight Oscars! Some aspects well-deserved but best picture - I dunnno. It was the only film we wanted to see out of eight last week, some others had Oscar winners for acting. Anyway, good luck to the makers of this British/Indian movie. Best picture award even though the film had no stars. Best director - Boyle, the British director who found the film of his career in the streets of Mumbai. Best adapted screenplay award for his handling of Vikas Swarup's novel. Best song for the upbeat "Jai Ho," the movie's finale which kept the audience (in our case) still in their seats till the very end. This morning I attended the funeral service for a very distinctive lady, a friend through art and poetry writing - Pat Raison. Our condolences to Ray Raison. It was a gathering of relatives, friends, artists and writers. 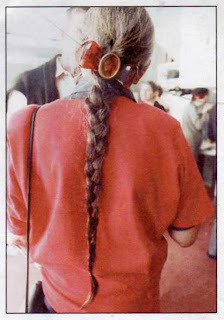 Amongst the tributes was a poem by a friend and a photo of Pat, turned away, her long plait swinging, on another journey. We were given copies of the poem with the photo. A couple of days ago I wrote the following for a local writers' newsletter. Pat with her distinctive voice and attentiveness to people will be well remembered. Pat is a very fine poet and artist. 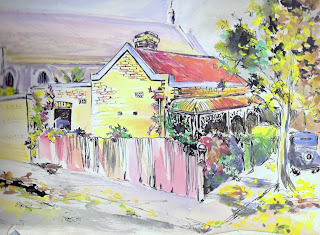 We visited Ray and Pat only one time in their home, but we were enchanted by the grace of her lovely artworks and their hospitality. A life well lived. Her care for detail, love of the natural world, and intellect gave her writing many layers to think about. The last verse of 'Cool coloured gull days' is an example. Occasionally I browse through an art exhbition in Geelong and this time I went to the Wintergarden cafe where there's a gallery upstairs. (Once upon a time a congregational church). 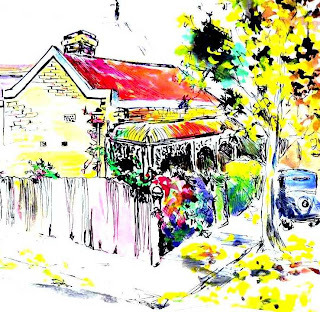 A group of local artists - Bruno Callori, Evan Callori, Lianne Gough, Jill Shalless, Faye Owen and Mick Kupresanin - went to the little tourist town of Marysville over a long weekend to paint. 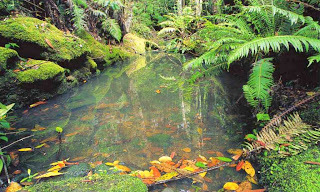 The paintings are lovely reminders now of what Marysville once looked like before the dreadful fires ten days ago) - a charming town, beautiful streams and forests. I especially liked the pastel pictures by Faye Owen. She was there working away, her fingers covered with black pastel. 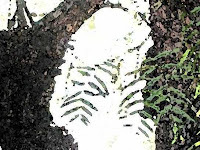 I remembered the time of the Ash Wednesday fire and a series of paintings I made the week after, and then the recovery of the bushland six months later. 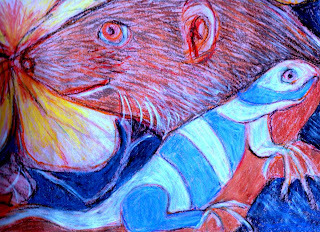 I was an art student at Deakin University at the time with plenty of opportunity to make drawings and paintings. Behind the Wintergarden cafe is a delightful Stone and Leaf shop crammed with sculptures, plants, decor for gardens, particularly with an Eastern kind of look. (About a year ago I did some drawings there.) 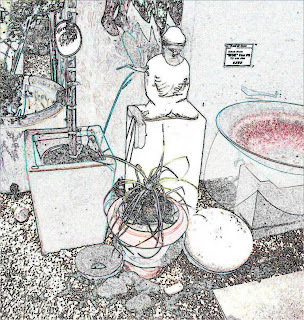 The objects were very crowded here, but they would suit a minimalist garden with stones, a buddha, and plants that don't need water. Our neighbour Chris (before the four houses went up) had such a back garden, and today - next door - they are working on the very small garden spaces available now that the houses are up and the paths made, etc. Probably stones and pot plants. It is always a fine occasion to welcome a new minister to a Uniting Church parish, a time of celebration and hope. Clergy wear white albs and red to signify a joyful occasion. Yesterday afternoon I went to St Andrews, our neighbouring church, where Rev Sani Vaeluaga was inducted to be the new minister of St Andrews and St Albans. The congregations are well known to us as our East Geelong was linked to both until recently. 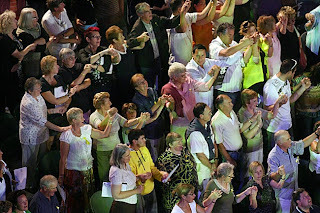 St Andrews church was full of people, including a Samoan choir from Keysborough in Melbourne and lots of well-wishers. It is a formal occasion but one of good feelings. Rev Robert Renton kindly gave me some of his photos as our camera was in Peceli's satchel and he'd gone up to Altona Meadows/Laverton to preach. During the afternoon tea I met several friends who I hadn't seen for a long, long time including a Samoan family who used to be in Lake Boga up in the Mallee in the manse there. The Samoan choir sang both in the church and in the hall with a very energetic pianist. Way to go. Now we have more Pacific Islanders in Geelong. 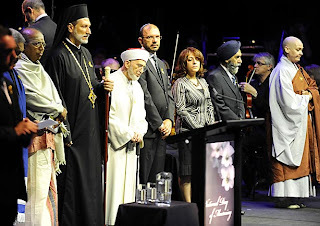 Rev Sani is from Samoa then New Zealand, then Diamond Creek and Hurstbridge and Heidelberg-East Ivanhoe in Melbourne. We welcome Sani, his wife Temukisa, and children Asomaliu, Alaoleula, Siniva, Filiata and Sani, and a delightful grandmother who will live with them. How close is Kinglake to Melbourne? 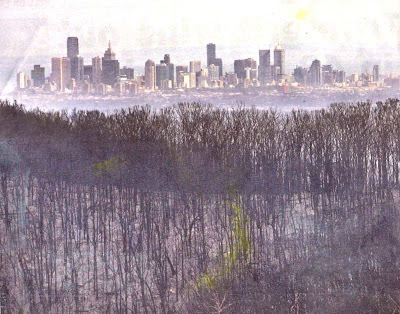 I realize now that the fires were really closer to Melbourne than I thought, judging by this photograph by David Geraghty published in Herald Sun Feb 12th. From the hilltop of Kinglake the people apparently could see the city of Melbourne and at night it must have been a beautiful sight. Kinglake, I read, does not have a lake, but was named after a Alexander Kinglake who passed through in 1870, just like Swan Hill doesn't have any hills, nor many swans for that matter! 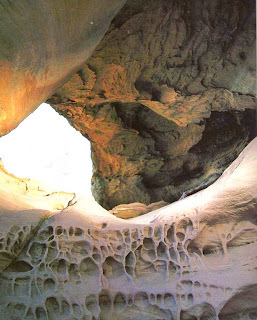 mountain town with a wealth of natural attractions. Kinglake is a small and elevated settlement situated located at the top of the Great Dividing Range 61 km north-east of Melbourne's city centre via Heidelberg. So it is closer to Melbourne than Geelong is to the city. 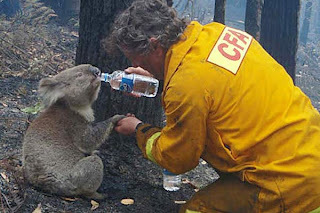 The media and world wide web have really exploited the story of a little koala about nine months old from Mirboo North when a volunteer firefighter gave her a drink from a water bottle. A mobile phone captured the incident and now it's around the world on youtube. A little video just made impulsively for his daughter. 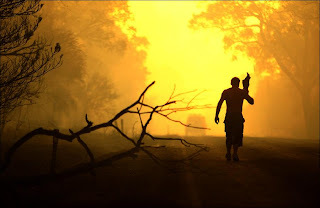 Mr Tree is a hero but an ordinary Aussie bloke - with tenderness - but he wasn't too happy when the photos were manipulated by the media to connect the story with Saturday's horrific fires in a different place. Sure, it was about bushfires but taken a few days earlier in Gippsland. 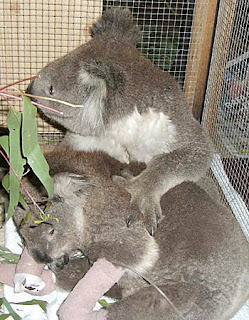 At the present day there are dozens of koalas in animal shelters, after the fires, including 'Sam' and 'Bob', so this is now a charming Valentine's Day photo, (not that I really care too much about Valentine's Day actually). The youtube site is a bit roughly shot but is charming. Courage, resilience, compassion - that's what we like to see in a bloke, so Mr Tree I could give you a hug for Valentine's Day! 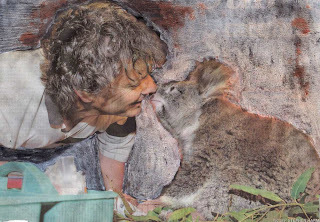 And Mr Tree and Sam the koala were re-united at the animal shelter a week after the fires at Mirboo North. From a photo by Stephen Harman, but I altered the background as it was too much information. Probably made it worse! Sorry, Mr Photographer! The only one who seems to be doing any drawing this week here(some posted on babasiga blog) is Peceli. 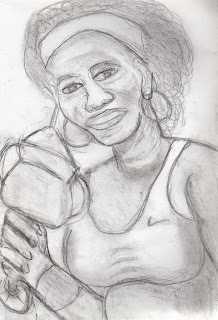 Here's one he did yesterday of Serena Williams who recently was a main player in the tennis in Melbourne. 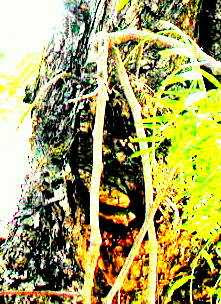 When you see a peppercorn tree in this part of the world it usually signifies a settlement about a hundred years ago. There are several along a fenceline in a couple of neighbouring properties on our road, so I took a couple of photos, then messed about with them. 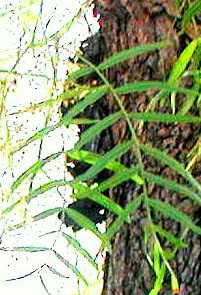 The trees are very shaggy and the peppercorns are green or pink in colour. Not many young ones seem to be deliberately planted, though I remember in Richmond (Melbourne) one time, at the Uniting Church there, Peceli drove over one little seedling when someone had locked his car inside a church compound and the only way out was to demolish the plant. Then he got the bill for $30! We argued that such seedlings are two for ten cents! 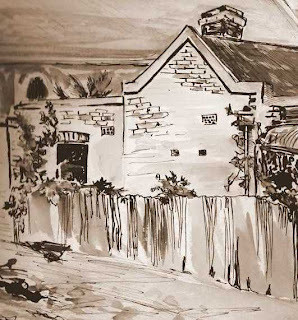 Another story - there was a great 'to-do' in a country town, Hopetoun, when a group of people wanted to chop down a group of peppercorn trees at the old primary school as another group of people regarded them a heritage. I wrote a ballad about it so I'll try and find the words. Two towns that were hard hit by the bushfires that started on Saturday were Kinglake and Marysville, now both almost totally destroyed. (Ironically, there's an art exhibition on in Geelong at the Wintergarten of beautiful landscapes of the Marysville area.) I have been listening to ABC 774 today which provides bushfire warnings (which is on-going) and news all day. Some of the victims waiting to return to see if their homes in Kinglake are still standing are at the evacuation centre at Whittlesea which is now inundated with police (good), the Salvation Army (good) Red Cross, (good) Emergency Services guys (good)and the media (well, I wonder). I was astonished to hear that there was a long line of vehicles full of news reporters going to the Kinglake site ahead of the victims being allowed to return. That is really wrong. Here are a few notes from a new item from Channel Nine - and I notice they didn't report the pushy journos rushing for stories. The Kinglake area remains the worst-hit by a fierce 220,000 hectare firestorm which ripped through the region on Saturday, killing 103 people so far and destroying over 550 homes. At least 33 residents from the township of Kinglake alone have been killed, and a further nine from Kinglake West, with more expected. The once idyllic communities of Kinglake, Strathewen and Marysville are little more than collections of ash and charcoal, with a few burnt-out house frames standing limply amid charred corrugated iron. The toll reached seven in tiny Strathewen where only three of the mountain hamlet's 40 houses were still standing. Nearby Marysville was annihilated and is one town to be declared a crime scene as police Chief Commissioner Christine Nixon confirmed some fires were deliberately lit. Ms Nixon said a taskforce would be set up on Tuesday to investigate arson. 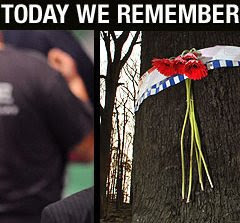 An emotional Prime Minister Kevin Rudd said the firebugs responsible were nothing short of mass murderers. "What do you say about anyone like that? There are no words to describe it other than mass murder," Mr Rudd said. "This is of a level of horror that few of us anticipated." The Churchill fire in Gippsland, which police confirm was deliberately lit, had killed at least 19 people by 6pm on Monday, including nine in Callignee. The 35,000 hectare blaze broke through containment lines earlier in the day and hit the town of Churchill, which is also a crime scene, and was threatening nearby Yarram. In the north of the state, fire around Dederang escalated significantly late on Monday afternoon, also threatening the towns of Beechworth and Yackandandah. The fire was spotting ahead of the main fire and ash and embers were threatening communities in Gundowring, Gundowring Upper, Glen Creek, Kergunyah South, Mudgeegonga and Running Creek. Country Fire Authority (CFA) volunteers have been traumatised by many of their gruesome discoveries and the job of searching for bodies has been taken over by specialised police Disaster Victim Identification (DVI) teams. Burnt-out cars which became tombs lined bush roads in the central highlands and volunteers were recovering the charred remains of friends and colleagues. As more horrifying stories unfolded on Monday, three sisters were waiting near a roadblock outside Healesville when they were told their parents and disabled brother were killed. Two of the sisters' husbands had gone through the roadblock in a desperate search for Faye and Bill Walker and their wheelchair-bound son, Geoffrey, 53, at their home in the nearby village of Narbethong. The husbands found their bodies inside the house, with their car parked outside, packed and ready to go with the key in its ignition and family dog in the back. The three daughters Marilyn, Julie and Vivian, were inconsolable as they cried and hugged each other at the roadblock when their partners returned with the news. Twenty serious burns patients have been admitted to The Alfred Hospital in Melbourne in 24 hours, all with burns to more than 30 per cent of their bodies. The Alfred's Dr De Villiers Smit told reporters the scale of the disaster is worse than the Bali bombings. "This is by far the worst disaster I've ever been involved with," he said. Huge emergency relief operations are underway throughout the state, with a massive exercise at Whittlesea which is serving survivors from Kinglake and its environs. As refugees flooded down the mountain from Kinglake and surrounding townships into Whittlesea, emergency relief workers headed the other way, taking desperately needed food, water and fuel supplies to those who have remained behind. "That's the second phase of the operation. First it's been making the area safe for firefighters to work in but also getting supplies and resources to people on the mountain who decided to stay and protect their properties," CFA spokesman Dave Wolf told AAP. Tent cities have been set up in areas such as nearby Yea, while caravans, community halls and strangers' houses have become homes to thousands of newly homeless Victorians. 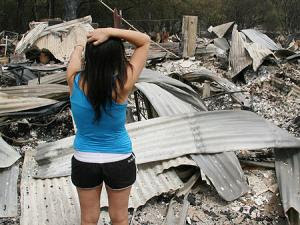 The Queen expressed her shock at the devastating bushfires in a message to Australia. "I was shocked and saddened to learn of the terrible toll being exacted by the fires this weekend," the Queen said in a statement. "I send my heartfelt condolences to the families of all those who have died and my deep sympathy to the many that have lost their homes in this disaster." Photos 1 and 2 from Australian Geographic, others from newspapers yesterday. Her beauty and her terrors. Dorothy McKellar's poem is not sentimental twaddle, or strange 'girt by sea' images of the national anthem. Here is the full poem she wrote. We usually only hear the second verse read.